For the live-updated, fully-labelled, interactive version of this infographic, click here. If you have allergies, you’ve probably tried many approaches to easing the sneezing, swelling, and suffering. You may have even compared your experience to other people with allergies, and tried what your friends recommend to ease the symptoms. But what if you could talk to 9,375 allergy sufferers at the same time and get a summary of all of their advice? That’s what we’ve done in the chart above. 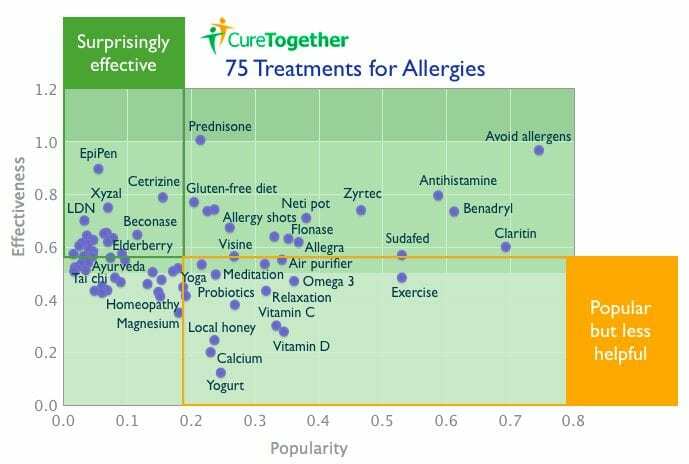 CureTogether – a free resource owned by 23andMe that allows people to share information about their health and treatments – surveyed more than 9,000 people who self-identify as having Allergies and asked them to rate the effectiveness of 75 different treatments. We gathered all the data and put it together for you here. People who participated in the survey reported that interventions such as avoiding allergens and nasal irrigation helped them feel better, as well as drugs like Prednisone, EpiPen, and antihistamines. Treatment ideas that didn’t seem to help as much included yogurt, calcium, Vitamin D, and local honey. These are all treatments suggested and reported by patients, so some redundancy in the terms used is to be expected. In addition, the term “treatment” in this study refers to anything patients describe using to help them feel better, whether it is an officially prescribed medical treatment or not. A startling 40-50 percent of school-age children are now experiencing sensitivities to allergens, and the prevalence of allergic disease worldwide has been increasing for the past 50 years. 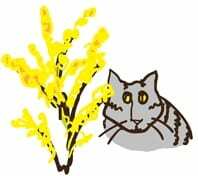 This is according to research from the American Academy of Allergy Asthma and Immunology. Where did this data come from? This is the result of a four-year CureTogether study on Allergies, in which 9,375 people shared information about their symptoms and what treatments worked best for them. We’d like to thank those who participated. And just as they shared their experience with treatments, we’re freely and openly sharing the results of the Allergies study. This is part of a regular series of CureTogether research findings. CureTogether’s research findings are different than those made by 23andMe, which look at genetic associations with illness, traits and drug response. But as we continue our work with the CureTogether community, 23andMe hopes to incorporate more of this kind of self-reported information into our own research. CureTogether present its findings just as they are – patient-reported data – to stimulate discussion and generate new insights for further research. Please tweet, blog, or pass this along to anyone who can benefit or is interested in Allergies.